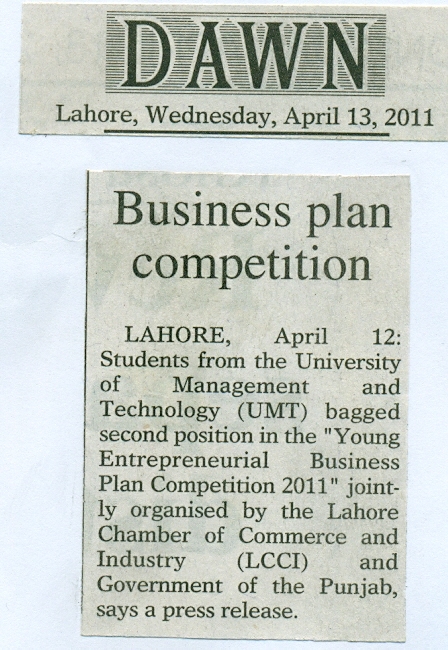 Students from the University of Management and Technology (UMT) bagged second position in the "Young Entrepreneurial Business Plan Competition 2011" jointly organized by the Lahore Chamber of Commerce and Industry (LCCI) and Government of the Punjab. 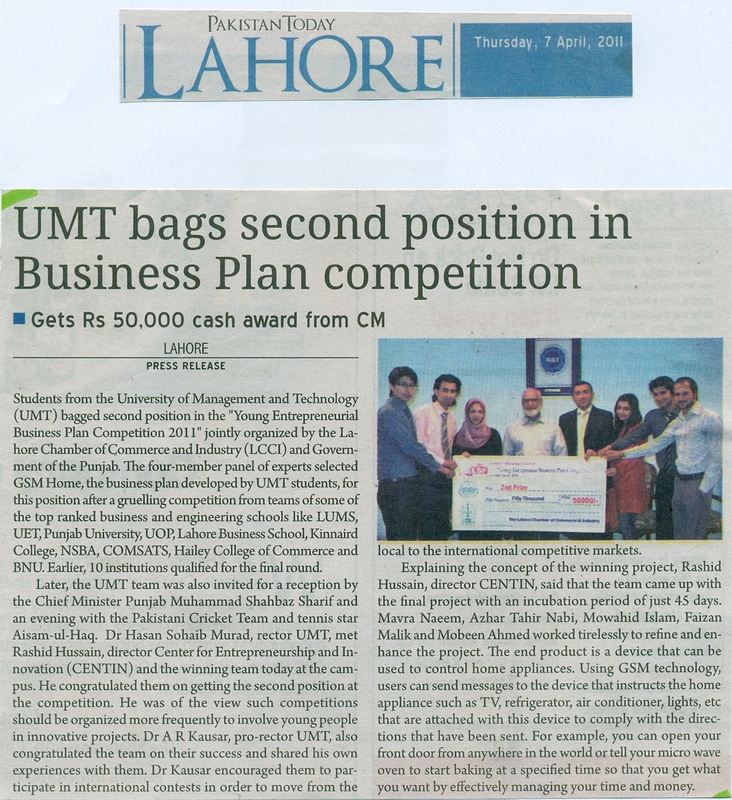 The four-member panel of experts selected GSM Home, the business plan developed by UMT students, for this position after a grueling competition from teams of some of the top ranked business and engineering schools like LUMS, UET, Punjab University, Lahore Business School, Kinnaird College, NSBA, COMSATS, Hailey College of Commerce and BNU. Earlier, 10 institutions qualified for the final round. Later, the UMT team was also invited for a reception by the Chief Minister Punjab Muhammad Shahbaz Sharif and an evening with the Pakistani Cricket Team and tennis star Aisam-ul-Haq. Dr Hasan Sohaib Murad, Rector UMT, met Rashid Hussain, Director, Center for Entrepreneurship and Innovation (CENTIN) and the winning team today at the campus. He congratulated them on getting the second position at the competition. He was of the view such competitions should be organized more frequently to involve young people in innovative projects. 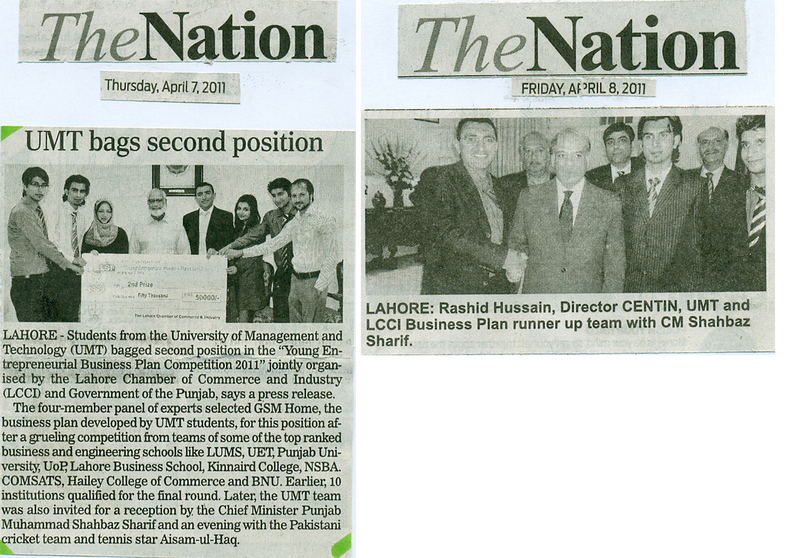 Dr A R Kausar, Pro-Rector UMT, also congratulated the team on their success and shared his own experiences with them. Dr Kausar encouraged them to participate in international contests in order to move from the local to the international competitive markets. 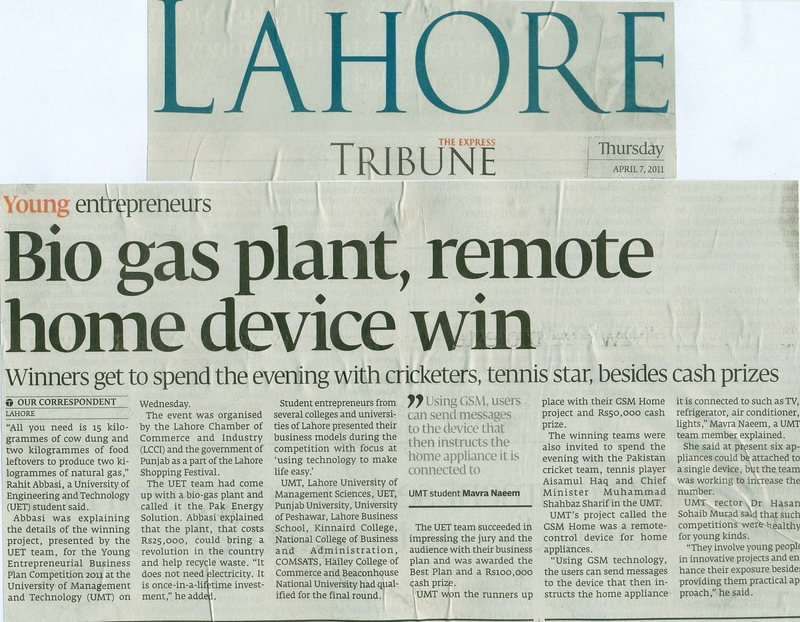 Explaining the concept of the winning project, Rashid Hussain, Director CENTIN, said that the team came up with the final project with an incubation period of just 45 days. Mavra Naeem, Azhar Tahir Nabi, Mowahid Islam, Faizan Malik and Mobeen Ahmed worked tirelessly to refine and enhance the project. The end product is a device that can be used to control home appliances. Using GSM technology, users can send messages to the device that instructs the home appliance such as TV, refrigerator, air conditioner, lights, etc. that are attached with this device to comply with the directions that have been sent. For example, you can open your front door from anywhere in the world or tell your micro wave oven to start baking at a specified time so that you get what you want by effectively managing your time and money. The basic concept of GSM Home is very simple. Once the device is attached to a machine, it processes the user’s instructions and sends coded instructions to the machine. At present, 6 appliances can be attached to the device but the team is already working on enhancements. One of the factors that weighed in favor of GSM Home was the micro level potential of the project. Secondly, it addresses convenience and security issues of today’s market in an effective manner. 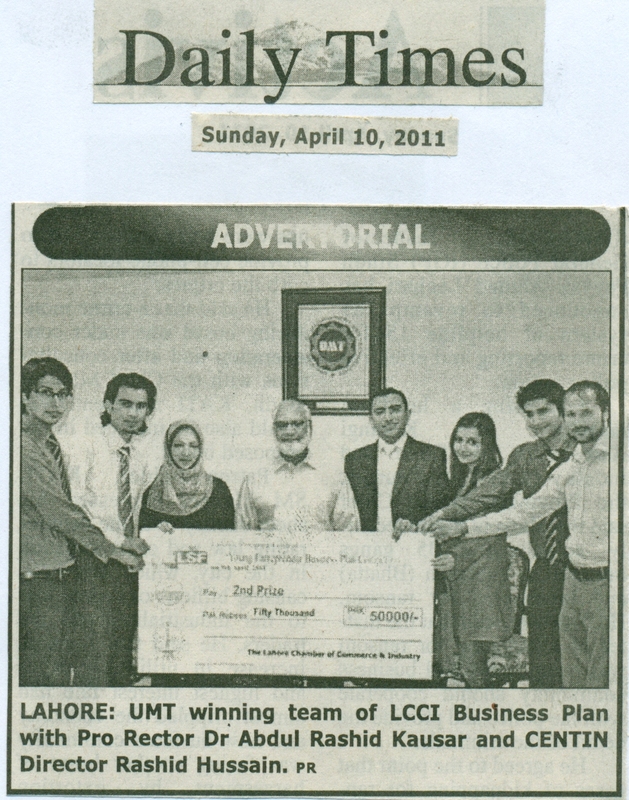 Each member of the UMT team made his/her unique contribution to the project. Mavra managed different aspects of the project, coordinated with all team members and presented GSM Home to the panel of judges. Azhar conducted the main research and worked on various project features. 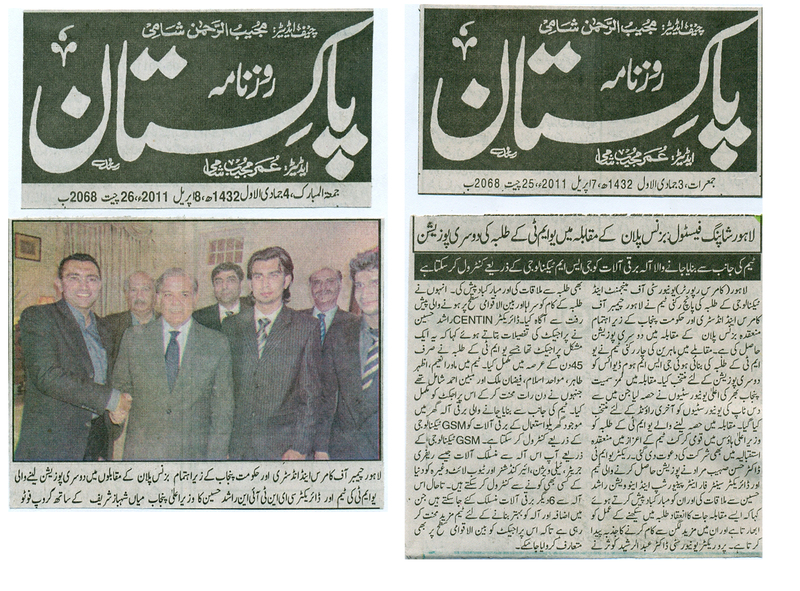 Faizan conducted the consumer market survey. Mohawid worked at the project finances and came up with different market strategies. Sundas Nazir, Research Coordinator for CENTIN, kept the team together through tough times and served as the motivation for the entire team – a fact that is acknowledged by all team members. The team already plans to take the project to the international level. They are seeking a patent for their product and working towards raising venture capital. 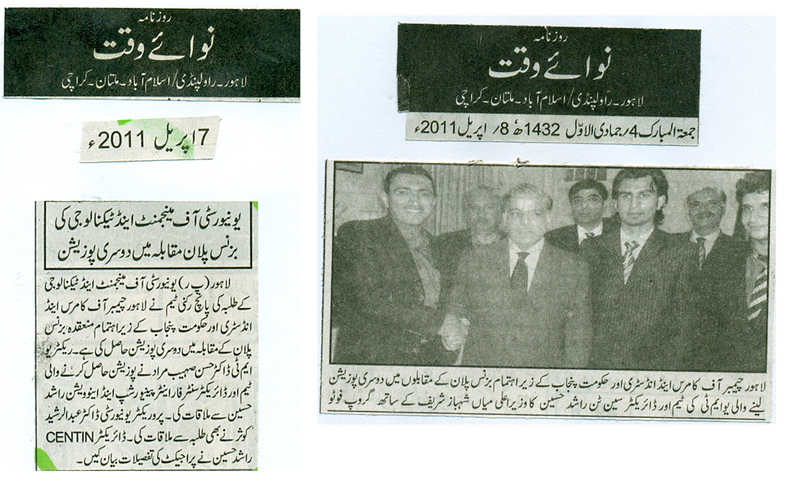 A number of investors and businessmen shave already shown interest in the product. 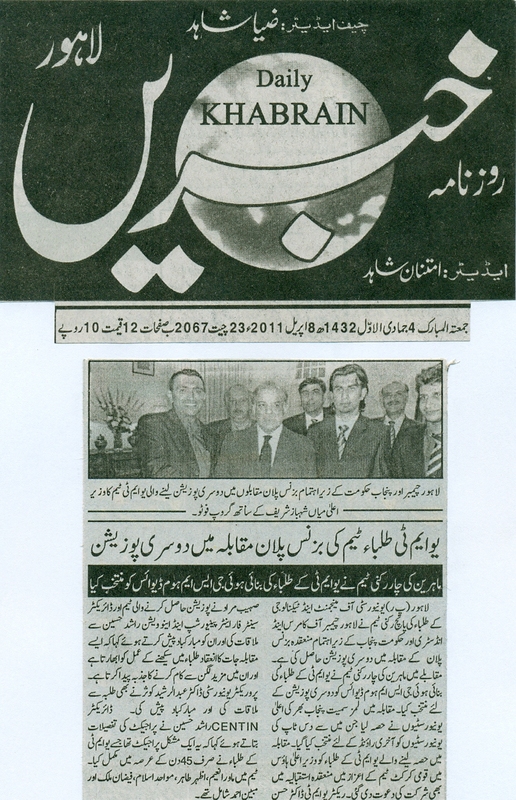 The LCCI Advisory Board has invited the team for a meeting. 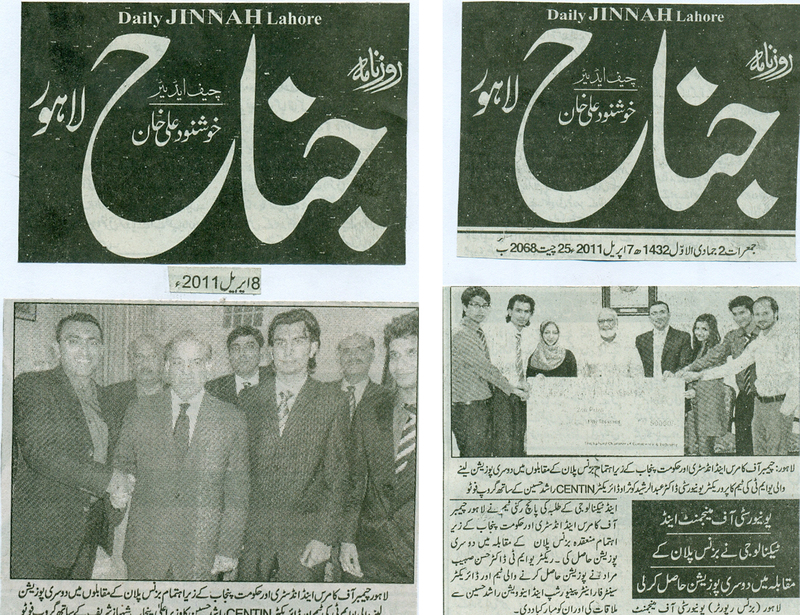 It is expected that research and funding would be provided for the project. Rashid Hussain, Director CENTIN, and the faculty of the School of Business and Economics (SBE) deserve special commendation for dedicating their time and expertise to advise the students in completing the project.